For the American football player, see Rube Marquardt. 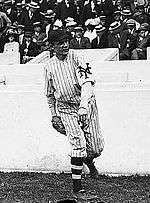 Richard William "Rube" Marquard (October 9, 1886 – June 1, 1980) was an American left-handed pitcher in Major League Baseball in the 1910s and early 1920s. He achieved his greatest success with the New York Giants. He was inducted into the Baseball Hall of Fame in 1971. Marquard was born in Cleveland, Ohio to German immigrant Fred Marquard and Lena Heiser Marquard. Rube Marquard claimed an 1889 date of birth, but 1900 census data and a birth certificate show an 1886 date of birth. Lena Marquard died of an abdominal infection in 1899 and Rube's grandmother took responsibility for raising him. Marquard quit school after the fifth grade; biographer Larry Mansch writes that he "simply refused to attend any longer." Newspaper reports first mentioned Marquard in 1905 when he played with an amateur team in Cleveland. Though pitching for a poor team that had a 1-15 win-loss record at one point, Marquard attracted attention as a top pitcher. He broke a City League record with 16 strikeouts in a game against a team known as Brittons Printing. In September, the City League season finished and he signed with the semipro Telling Strollers, an independent team sponsored by an ice cream company. He started his minor league baseball career in 1906. Despite his nickname, he was a city kid. As he told it in The Glory of Their Times, a writer in his minor league days compared him favorably with Rube Waddell, and very soon Marquard was being called "Rube" also. In 1907, he went 23-13 with a 2.01 earned run average and led the Central League in wins. In 1908, he went 28-19 with a 1.69 ERA and led the American Association in wins. The New York Giants purchased Marquard for $11,000 – a then unheard-of sum to pay for a baseball player's contract – and his lack of success early in his major league career led to his being tagged "the $11,000 lemon". From 1911 to 1913, Marquard won at least 23 games each season and helped the Giants win three consecutive National League pennants. In 1911, he led the league with 237 strikeouts. In 1912, he led the league with 26 wins. He also made baseball history by winning 19 decisions in a row. Marquard allegedly celebrated by buying an opal stickpin to reward himself. Upon being told by a friend that opals were a jinx, he threw the pin into a river; but apparently the curse had already done its work, as he lost his next decision. In 1914, Marquard went 12-22, and in 1915, he joined the Brooklyn Robins. He helped the team win pennants in 1916 and 1920. He then played for the Cincinnati Reds and Boston Braves. Marquard finished his major league career in 1925 with a record of 201–177 and a 3.08 ERA. 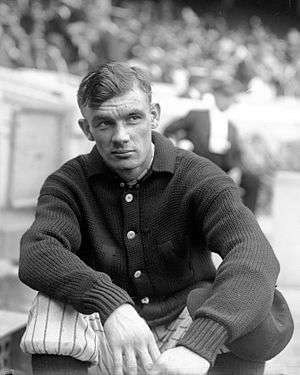 His 1,593 strikeouts, at the time, ranked third in major league history among left-handers (behind Rube Waddell and Eddie Plank), and stood as the NL record for southpaws until his total was surpassed by Carl Hubbell in 1942. He later pitched and managed in the minor leagues until 1933. After baseball he worked as a betting window teller at Narragansett Park. Marquard was a performer in vaudeville, appearing with Blossom Seeley and later marrying her. He was elected to the Baseball Hall of Fame in 1971. His selection has often been criticized by the sabermetrics community, since Marquard's career adjusted ERA+ was only slightly better than league average. Bill James described Marquard as "probably the worst starting pitcher in the Hall of Fame." Marquard had been interviewed for the popular baseball book, The Glory of Their Times, in the early 1960s, and his chapter is thought to be one of the primary reasons for his election. However, most of the stories that he "recounted" were later found to be false. Marquard died in Baltimore, Maryland at age 93. He is interred in Baltimore Hebrew Cemetery in Baltimore, Maryland. Mansch, Larry D. Rube Marquard: The Life and Times of a Baseball Hall of Famer. McFarland, 1998. ISBN 0786404973. 1 2 "Rube Marquard Minor League Statistics & History". baseball-reference.com. Retrieved February 1, 2013. ↑ Ritter, Lawrence S. The Glory of Their Times. ↑ "1907 Central League Pitching Leaders". baseball-reference.com. Retrieved February 1, 2013. ↑ "1908 American Association Pitching Leaders". baseball-reference.com. Retrieved February 1, 2013. 1 2 3 4 "Rube Marquard Statistics and History". baseball-reference.com. Retrieved February 1, 2013. ↑ Kieran, John (August 18, 1934). "A Flying Visit to Narragansett". The New York Times. ↑ James, Bill (1994). Whatever Happened to the Hall of Fame? Baseball, Cooperstown, and the Politics of Glory. New York: Fireside. p. 170. ISBN 0-684-80088-8. ↑ Neyer, Rob & Epstein, Eddie (2000). Baseball Dynasties: The Greatest Teams of All-Time. New York: W. W. Norton & Company. p. 100. ISBN 0-393-32008-1.